The Linksys WAG120NUK N150 Wireless ADSL Router is the ideal choice for the heart of your home network. The built-in ADSL2+ modem plugs directly into your internet connection, and the router function works to connect your computers, game consoles, and other network-enabled devices together and to the internet by being directly plugged in or through high-speed wireless. 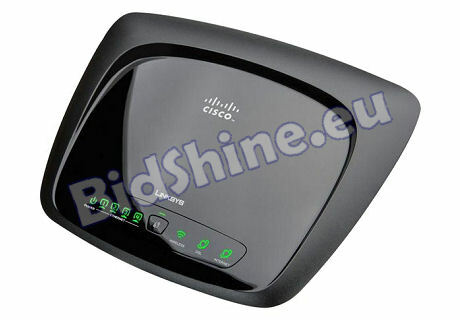 The Linksys WAG120NUK N150 Wireless ADSL Router is easy to set up and gives you a fast, ?Always On? connection to the internet. There are four ports on the Linksys WAG120NUK N150 Wireless ADSL Router, giving you the flexibility to add up to four connectable devices using an ethernet connection. If you want to feel the benefit of a wireless home network, the Linksys WAG120NUK N150 Wireless ADSL Router is easy to set up, and with Wi-Fi Protected Setup you can rest assured that it will be secure too. The information you send around within your home network is also protected because wireless transmissions are encrypted along with a powerful SPI firewall that can protect you from many of the known internet attacks. You can also choose between WEP, WPA Personal, WPA2 Personal, WPA Enterprise, WPA2 Enterprise, or RADIUS for your wireless security so that you can set up a password for your wireless network to ensure it is kept private. The Linksys WAG120NUK N150 Wireless ADSL Router uses the latest Wireless-N technology, giving you a faster signal with a better range. The specially designed internal antennae also increase range, which is great for people who want to stream video, play online games or make VoIP calls. This wireless router comes with a feature called Quality of Service (QoS), which instructs your network to prioritise the internet traffic that is more time-sensitive. So if you're making a VoIP call or you're streaming music or video, that will be prioritised so your call will suffer less delay and your music or video will be much smoother. If you're a keen online gamer you can even tell Linksys WAG120NUK N150 Wireless ADSL Router in advance which games you want to have priority. It doesn't stop there as you can also prioritise your devices, a specific ethernet port or voice device.